Appeal to help complete the film of the action. 5 February 2014: The Crown has dropped its million dollar civil lawsuit against Adrian, Peter & Sam, after years of pursuing them through the courts. High Court associate Judge David Gendall delivered his summary judgement ruling yesterday in relation to the Crown Civil suit of the three Waihopai Christian activists. In a 15 page decision Judge Gendall concluded that the defences raised by the three peacemakers fails to make the threshold for an arguable case and has awarded damages against the three men pre-emptively without allowing the case to proceed to a trial. In contrast, after eight days of evidence at the activists’ criminal trial in March last year, a jury ruled the men not guilty of all criminal charges. “Judge Gendall’s media comments indicate that, rather than honouring the specific arguments of the civil case, he has perhaps fallen victim to the same temptation as the prosecution; the tendency to see this suit as a second chance at sending a deterrence message after the criminal trial declared the disarmament legal” said Mr Leason. The decision to seek summary judgment rather than proceeding to a trial is an understandable compromise between the government’s embarrassment at last year’s acquittal and the GCSB’s reluctance to be subject to any kind of public scrutiny. It is a novel measure to seek an alternative route to punishment through the civil courts. Documents unveiled by whistleblower website Wikileaks recently revealed that after the 2006 acquittal of the Irish ‘Pitstop Ploughshares’ who disarmed a US war plane at the Shannon Airport in the early days of the Iraq war, US officials contemplated suing the peacemakers for damages. US ambassador to Ireland James Kenny wrote to then-US Secretary of State Condoleezza Rice in the wake of the acquittal assuring him of Irish government’s loyalty to US war efforts “in the face of public criticism”, and suggesting a civil suit or similar measure “to convey [US] dissatisfaction with the Shannon Five verdict”; but evidently it was not considered worthwhile. Documents were produced during the criminal trial costing repairs to the Waihopai radome and fencing at approximately $1.2 million. Attorney-General Christopher Finlayson has signalled the Crown’s intention to seek recovery of the full amount plus court costs. He did not make any attempt to defend the $500 million of taxpayers’ money spent on building the base over the past 22 years amid the complete absence of any measurable benefits for New Zealand. Commenting at the conclusion of the trial, Graham Bidois Cameron, Waihopai Ploughshares media spokesperson, said this Ploughshares action is part of an ongoing tradition: “The practice of non-violent resistance and direct action in the cause of peace has a long history in this country – the peaceful resistance to the invasion of Parihaka, and non-violent direct action against nuclear armed warships entering our harbours being just two examples”, he said. A formatted copy of this release is available here. As you may be aware, the trial date for the Waihopai Ploughshares team has been set and the trial will begin in Wellington on 8 March 2010. The Wellington Ploughshares Support group has begun planning some of the events that will take place before and during the trial, and this message is to invite you and your organisation to become involved – wherever you are based, you do not need to be in Wellington to support Waihopai Ploughshares before or during the trial. There are four sections below: some background information; support around the Waihopai Ploughshares trial; details of the planning meeting in Wellington on Tuesday, 15 December; and a copy of the Waihopai Ploughshares statement. 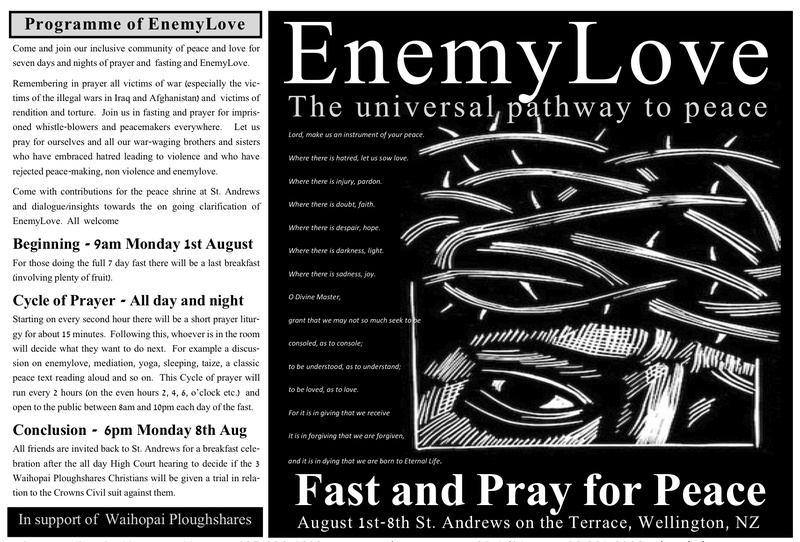 This message will be online at http://www.converge.org.nz/pma/pldec09.htm later today. At 6am on the morning of 30 April 2008, three members of a Christian Ploughshares team entered the Waihopai spy base and used sickles to deflate one of the two 30 metre domes covering satellite interception dishes. 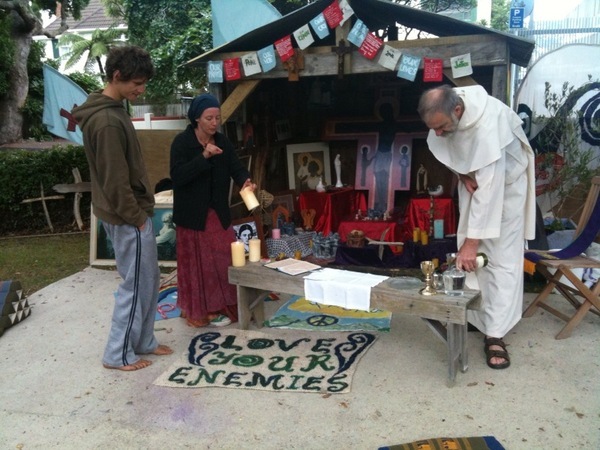 They then built a shrine and prayed for the victims of the war with no end – the so-called ‘War on Terror’ led by the United States government which also controls the NZ taxpayer funded Waihopai base. As mentioned above, the Wellington Ploughshares Support Group has begun planning events around the trial in Wellington, as has the Anti-Bases Campaign. There will be a range of activities and events in the run-up to, and during the trial – currently being discussed are some Fundraising for Iraq events in February (see http://www.converge.org.nz/pma/pl200808.htm for details of the previous event), workshops and other activities during the weekend of 6 – 7 March, a support gathering on the Monday morning as the trial opens, with a ‘Women say no to spy bases’ action in the early evening to mark both the opening of the trial and International Women’s Day, Stations of the Cross around relevant Wellington institutions on the Tuesday early evening, and a public meeting organised by the Anti-Bases Campaign on the Wednesday evening. In addition there will be vigils, including prayer vigils, at various times of the day during the trial. As well as the events in Wellington, it would be great if you or your organisation can begin planning what you might do in your community, your place of worship, or your town / city in the run up to and / or during the trial – keeping in mind and respecting the non-violent philosophy of Ploughshares. There are any amount of things you could do – writing letters to the editor of your local or national print media; organising a public vigil or picnic or other public demonstration of support for the trial; arranging for prayers to be said in the run up to, and during the trial, in your place of worship; organising a public meeting to spread the word about the Waihopai spy base and Ploughshares; supporting the sign-on support statements which will be circulated early next year … and we’re sure you can think of more. Please feel free to contact the Wellington Ploughshares Support Group c/o email pma@xtra.co.nz to discuss your ideas, or to let us know what resources might be useful for you, or other ways we can help. Finances: if you would like to make a donation to Waihopai Ploughshares, please send your cheque payable to ‘Peace Movement Aotearoa – Special Projects’, with a note saying it is for Ploughshares, and your name and address (if you’d like a receipt) to Peace Movement Aotearoa, PO Box 9314, Wellington 6141. If you would like to make a direct credit to the account, please contact email pma@xtra.co.nz for the details. A planning meeting for anyone interested in organising around the trial will be held from 5.30pm to 7pm in the mezzanine floor meeting room, Wellington Central library, Victoria Street, on Tuesday, 15 December. How does Waihopai involve NZ in America’s wars? Waihopai’s “Big Ears” cover a vast area of the Pacific. Although Iraq is on the other side of the world, the US military/intelligence network that is waging that war is global and depends on global facilities. In Afghanistan, the US military is heavily dependent on electronic intelligence (and mistakes in that intelligence have led to the deaths of innocent children, instead of the intended “terrorist” targets). If New Zealanders disagree with US policies and warmongering, then Waihopai is located right here to monitor our own international e-mails and phone calls and report directly to Big Brother at our expense – because we pay for Waihopai with millions of our tax dollars every year. The Bush Administration has pronounced Intelligence to be the key component of all the wars that it is fighting, or planning to fight, throughout the world. Thus, much more so than any token commitment of the SAS or a frigate, the Waihopai spybase is New Zealand’s key contribution to all these American wars. – Waihopai does not operate in the national interests of New Zealand or our neigh­bours. – Basically it is a foreign spybase on NZ soil, being paid for by NZ taxpayers and directly involving us in America’s wars that have no end. – Waihopai must be closed. A District Court Judge has directed that a jury trial for the charges against Peter, Adi & Sam will take place in Wellington at a date yet to be confirmed. ANZAC Ploughshares are preparing to submit a tender for renovation work required at GCSB’s facility in the Waihopai Valley. Build new office space (7 offices occupying 130 sq M) within the existing buildings using predominately aluminum joinery and building materials designed to reduce external noise from entering office space and noise caused by reverberation effects from within office space. Construction of office space is planned to start 1 July to be completed by 31 July 2009. The Ploughshares are confident their tender will be successful as it is likely to be the lowest tender price (free) and because it focuses on the demolition aspects of the work required – for which members of Ploughshares have a proven track record at the Waihopai spy station. “While we would never claim to be experts, we do believe Ploughshares groups throughout the world are industry leaders in the renovation and conversion of these types of facilities to more useful purposes.” said a spokesperson. Peter, Adi & Sam have pleaded not guilty to two charges, one of intentional damage and the other of burglary. All three have been out of jail since they were released from Blenheim Police station five days after their arrest. They did have a non-association order but this has since been removed. Peter is living in Auckland, Sam in the Hokianga and Adi in Otaki where he and Shelley have just brought their seventh child, Davey, into the world (14 March 2009). All three men have had many opportunities to speak to audiences and the media about their views on Waihopai and the New Zealand government’s role in international spying. The group were pleased to hear that two MPs who have been long-time critics of the lack of public information about the Security Intelligence Service and Government Communications Security Bureau have been appointed to the parliamentary committee that oversees these agencies. 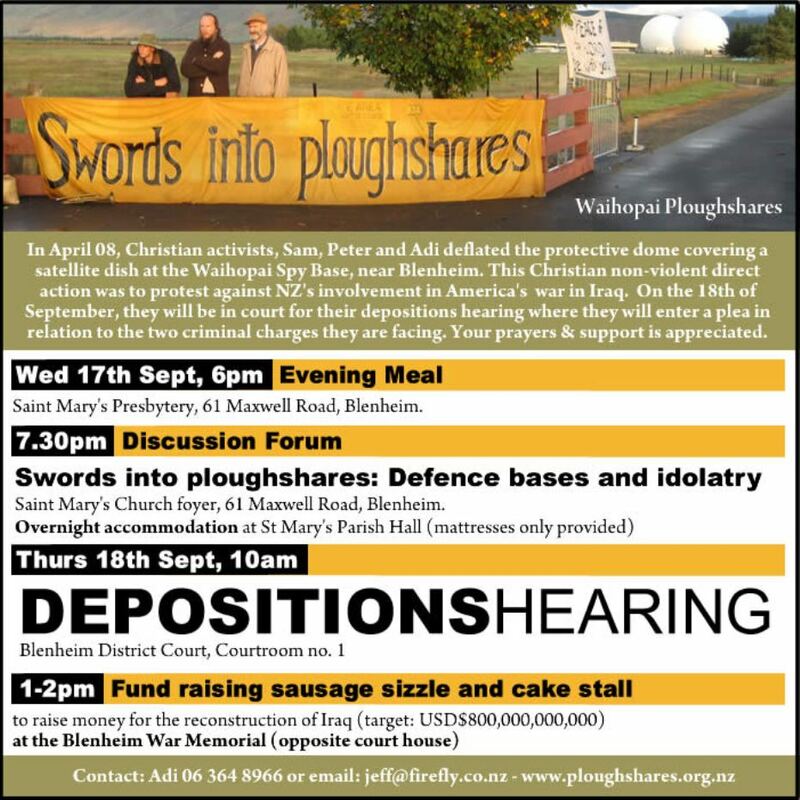 On Thursday, 18 September * 10am – depositions hearing, Courtroom No 1, Blenheim District Court, 58 Alfred Street * 1pm to 2pm – sausage sizzle and cake stall to raise money for the reconstruction of Iraq (target:USD$800,000,000,000) at the Blenheim War Memorial, opposite the court house. From 1pm to 2.30pm – peaceful presence at the GCSB HQ, Freyberg Building, corner Aitken Street and Mulgrave Street (opposite Archives NZ), with music, and more! All welcome, come along and support Ploughshares non-violent / faith-based kaupapa; for more information contact the Wellington Ploughshares Support Group. From 12.30pm to 2pm – peaceful presence outside the US Consulate, Citibank Building, 23 Customs Street East (corner of Commerce Street). All welcome! come along and support Ploughshares non-violent / faith-based kaupapa, for more information contact the Auckland Ploughshares Support Group. * Thursday 18 September is the date set for the Depositions Hearing – this is where the Police present their evidence and witnesses to the judge and defence. One day has been set as the time required for this hearing – so supporters are encouraged to try and attend as this is one of the few chances we will have to show that a significant proportion of the public support the action and draw attention to the issues it raised (NZ’s small but significant contribution to the War With No End, US occupation of Iraq, US global military and economic hegemony, etc.). Activities are being planned for the night before and marae-style accommodation has been organised. Speakers and a vigil will be organised outside the Blenheim Courthouse – email us (ploughshares08@gmail.com) if you plan to drive or want to hitch a ride to get there. * The Mega Sausage-Sizzle & Cake Stall organised by Adi last week to fund the reconstruction of Iraq failed to reach the US$80billion target. While disappointed, Adi was encouraged by the well-behaved crowd of supporters who turned out to help eat the food. Photos available here thanks to Peace Movement Aotearoa. A fundraiser at the depositions hearing will aim to make up the shortfall and reach the US$80billion target. * Many thanks to Paul Frazier from Syracuse, New York who generously gave his time to input email addresses to this mailing list database from the messages of support on the Waihopai ANZAC Ploughshares website. Welcome to those who haven’t received one of these updates previously – they seem to come out about once or twice a month. See the link at the bottom of this email if you would prefer not to receive occassional updates. * We have almost secured enough loans to cover the publishing costs for Ciaron O’Reilly’s book “Bomber Grounded, Runway Closed: Prison Letters & Court Notes of a Gulf War Resister”. We hope to sell the book internationally as a fundraiser for future Ploughshares activities and thanks to the generosity of supporters we have a number of loans pledged ranging from $400 to $2,000. Lenders can let us know when they would like the money repaid – we are hoping to have covered costs within two years but if this is too long then let me know. The text and images have been received from Ciaron and the book is currently being redesigned – if anyone has images you think might be appropriate for the cover or inside let us know. And if you are friends with Martin Sheen or another celebrity who might write a new Foreword (and potentially broaden the appeal of the book to wider audience) that would be great too. Thanks to Peace Movement Aotearoa, photos from yesterday’s Waihopai Ploughshares cake stall fundraiser (US$80billion target) for the reconstruction of Iraq are now available here. If I had a sickle: Public talk and film screening on Saturday evening, 26 July at 6:30pm at St Johns Church (corner of Willis and Dixon Streets), Wellington. The public talk features Adrian Leason, one of the courageous ANZAC plowshares, speaking about his role in deflating the Waihopai spy base dome. The film is ‘Islands of the Empire’ the 1985 Vanguard film by Alister Barry, Rod Prosser and Russell Campbell that explores the military relationship of US and NZ. Depositions Hearing: Lawyers for the ANZAC Waihopai Ploughshares defendents unsuccessfully tried to have the depositions hearing shifted to Wellington to reduce travel costs – but this was opposed by the Crown and denied by the judge. “Bomber Grounded, Runway Closed” – book reprint: Thanks to the many people who responded. So far we have $7,000 in loans pledged toward the $12,000 required to reprint this book as a fundraiser for Ploughshares. Loans of $100, $500, $1,000 or $2,000 would be gratefully received. As another way of promoting and explaining the praxis of Ploughshares actions supporters are interested in reprinting Ciaron O’Reilly’s 1994 book “Bomber Grounded, Runway Closed: Prison Notes of a Gulf War Resister”. You can find book reviews if you Google the title. The book is now out of print but Ciaron has the layout as a digital file and is willing to write an updated Foreword – Moana Cole would write one too. The original production was 2,000 copies of the 255 page book. To print 2,500 copies in New Zealand it will cost about NZ$12,000. If we can sell them for $12-15+pp each – that will eventually raise about $30,000 for further Ploughshares stories (like a film and/or book about the ANZAC Waihopai Ploughshares) and the process of PS story-telling will continue. So, if we can find 5 people who have $2,000 that they could provide as a medium-term loan – hopefully 2-3 years or less – then we will add it to the $2,000 already pledged for this purpose and we can get a new edition of the book printed and distributed. If this might be you, please email us: ploughshares08@gmail.com and we’ll start talking about how to make it happen. Sam, Adi and Peter successfully negotiated changes in their bail conditions so that they no longer have to report every two days to a local Police station – and more significantly – they have no restrictions on associating with one another. Subsequently the three men are looking forward to being reunited in the next few weeks. Sam, Adi and Peter have been granted bail on the condition that they do not associate with one another and stay away from military bases. This is a call-out to get as many supporters as possible to Blenheim on Monday to support the three Waihopai ANZAC Ploughshares activists who were arrested for deflating one of the domes. They will appear in court at 10am on Monday. We will be meeting at Seymour Square at 9.00am for a vigil and speeches. At 10am we will then continue the vigil outside court and go in to support and stand in solidarity with the arrestees. After court there will be a march to the rotunda at the corner of High and Market Streets where we will leaflet the public. Finally there will be a vigil at the Waihopai Spybase at 2.00pm, the scene of the real crime. If you can make any or all of these solidarity actions that would be great. At least three car loads, but hopefully more, will be traveling up from Christchurch and a number of people will be traveling down from the North Island to show their support and solidarity for this action. This is an opportunity to expose Waihopai for what it is – a foreign spybase on NZ soil that directly involves us in America’s wars. It is equally important that Sam, Adrian and Peter who took the action know that they have supporters. Addington Womens’ Revolutionary Craft Circle invites women to join a solidarity action in support of ANZAC Ploughshares on Monday at 10am outside the US military base at Harewood. This is a solidarity action to coincide with the Ploughshares arrestees’ next court appearance. Tea, fruit and biscuits will be served and the area transformed into a community space for morning tea. We will have a card of support available to sign for Ploughshares arrestees, Peter, Adrian and Sam. This is a child friendly action. Meet at the Totem Pole, Christchurch Airport, at 9:45am. Police have confirmed they will not be laying sabotage charges against Sam, Peter and Adi. The three men have been charged with intentional damage and entering a building to commit a crime – they will also face a charge of intentional damage to a fence on a vineyard neighbouring Waihopai spy base. Sam, Peter and Adi are being held in separate cells at Blenheim Police Station. They are in high spirits and are enjoying their fellowship with the Police staff supervising them. Lawyers representing the three men has been in regular contact with them and will travel to Blenheim on Monday for the second bail hearing. Hundreds of messages of support and donations from members of the public endorsing the action have already been received. There is wide interest in the Ploughshares message from both the Christian family and wider population – Ploughshares supporters have had many opportunities to talk with others interested in a faith of love in action. Sam, Peter and Adi have been denied bail and will remain in custody until at least Monday. Supporters are encouraged to attend the next hearing at Blenheim District Court on Monday… and to leave messages on this site. More details to come.